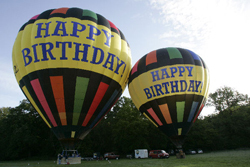 Many of our passengers are buying hot air balloon rides as a gift for a birthday so now we have a beautiful hot air balloon with Happy Birthday on it. 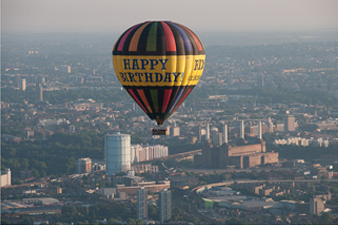 We often fly our Happy Birthday Balloon on our York balloon flights. If you'd like to fly in this balloon just check with our staff that we plan to use it for the flight date you would like to fly on. 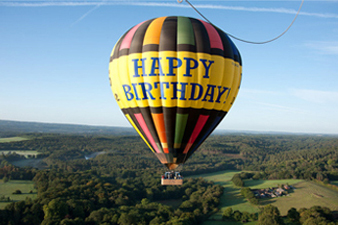 It's a great way to say Happy Birthday with a 100 foot high hot air balloon and it creates quite a stir when it flies over the Yorkshire countryside. 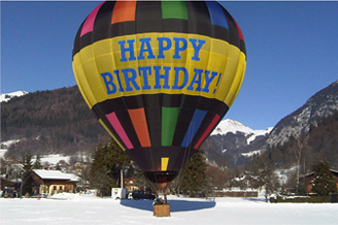 When the balloon flies at low altitudes, people on the ground often sing "Happy Birthday" to the passengers!